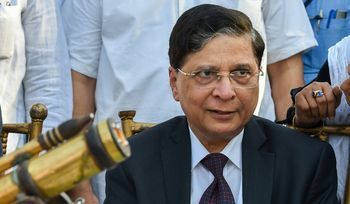 Recently, 64 members of Parliament and seven recently retired MPs from seven opposition parties moved a notice for impeachment of Chief Justice Dipak Misra, accusing him of ‘misbehaviour’ and ‘misuse of authority’. The notice levelled five charges of misbehaviour. It was moved a day after the Supreme Court rejected a bunch of petitions seeking an independent investigation into the death of judge B.H. Loya, who was hearing the Sohrabuddin Sheikh encounter case. This was the first attempt in the history of India to impeach a Chief Justice of India (CJI). The notice for impeachment was moved before the chairman of the Rajya Sabha, as it was signed by its members [the minimum requirement is signatures of 50 members of the Rajya Sabha]. Article 124(4) of the Constitution mandates that in case the notice is accepted by the chairman, a three-member panel, comprising a chief justice of a High Court, a Supreme Court judge and an eminent jurist, should be constituted to investigate the charges. After investigation, if the panel finds the judge guilty, the house can take it up for discussion. The house is required to pass the motion by a special majority, with two-third members present and voting, and supported by more than half of the total members of the house. After passing, the motion goes to the second house, which is also required to pass it by a special majority. It is then presented before the President, who can pass an order for the removal of the judge. The chairman of the Rajya Sabha rejected the notice after consulting legal and constitutional experts. This decision was not accepted by the opposition parties, and they decided to file an appeal in the Supreme Court to review the chairman’s decision. It was also represented before the court that the review should not be placed before the chief justice and that it should be reviewed by a bench presided over by the second senior-most judge in the court. The court, however, decided to list it before another bench of five judges. Being aggrieved of this order and seeking a copy of the ‘administrative order’ issued by the court, the signatories to the notice decided to withdraw it. They contended that they were aware that they did not have the numbers in the Upper House to get the resolution passed. There were animated discussions in the country whether the decision to issue the notice was politically motivated, since ab initio it was known that the opposition did not have the numbers to have it passed. The Constitution makers had provided for a process of impeachment to ensure the accountability of the judiciary and yet made the process stringent so that mere political considerations do not attempt to erode its credibility. In a 2010 interview, Kapil Sibal, then minister in the UPA government, observed that he does not accept the impeachment process if political parties in the opposition are involved and they have to vote on the basis of a whip issued by their party. However, this is the very path the opposition has adopted in the current episode. Without going into the merits of the allegations levelled against the CJI, or the grounds for rejection of the notice by the chairman, we need to debate whether any of the three pillars of Indian democracy, which have been the bedrock of India’s development in the last 70 years, should ever be weakened at the behest of a handful of politically motivated objectives. It is natural, as has happened, that if the opposition targets a particular institution, the government will rally around it. However, in the process, especially so in the case of the judiciary, which quite often has to take strong positions against the executive, the independence of the judiciary gets impaired. A corollary of the process would imply that if the executive were to be unhappy with any particular decision of the judiciary, and since they have the numbers in Parliament, they could initiate a process for impeachment of a judge on the grounds of ‘misbehaviour’. Indian democracy has been a shining example of enabling rapid economic development, keeping the welfare of the citizen at its core. Its institutions have stood the test of some very testing times. We need to strengthen these institutions to ensure a bright future for our citizens by rising above political and other narrow confines. The citizen has displayed the will to do so, and in going forward we need to reinforce that commitment in him. Former comptroller and auditor general, Rai is head of the Supreme Court-appointed BCCI's committee of administrators.